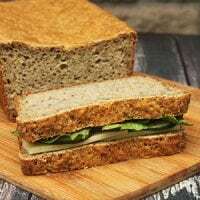 This nutrient-dense, sprouted whole-grain flour bread has that warm yeasty smell and good taste that you expect from homemade bread. No eggs, dairy, or xanthan gum! Makes 1 loaf. Line a loaf pan* with parchment paper, so that the parchment extends about 1 inch above the sides of the pan. This will help the bread to keep its shape as it rises. Lightly grease the parchment with olive oil. Combine warm water, yeast, and 1 teaspoon honey or maple syrup. Set aside for 5 to 10 minutes until bubbly. In a separate bowl, combine brown rice flour, sorghum flour, millet flour, tapioca starch, baking soda, and sea salt. Set aside. Once yeast mixture has become foamy, stir in olive oil, additional honey or maple syrup, ground chia seed, and psyllium husk. Let sit for 2 to 3 minutes to allow the chia seed and the psyllium to thicken. Then whisk this mixture into dry ingredients. Continue mixing batter with a wooden spoon until all of the flour is incorporated. The dough will be wet with a consistency similar to a quick bread. Spoon into prepared pan and use the back of a spoon to shape into loaf. Cover with a cloth and let rise in warm place for 40 to 50 minutes. Once bread has risen about 1 inch over the sides of the pan, place in preheated oven and bake for 60 minutes. When done, the bread should sound hollow when gently tapped on the bottom. Cool bread on a wire rack. Do not slice until completely cool. This bread is best eaten the day it is made, or frozen in slices and thawed as needed. It can be kept on the counter in a sealed container for a few days, but it will lose moisture and be best eaten toasted.